Various plug-in modules exist for the RDR series devices 54/55/160 for equipping the basic units on the front and back. Standard ADC module for RDR54/55. The module contains a preamplifier and filter for 1 kHz to 30 MHz and 50 to 54 MHz range. Version DF additionally supports 87.5 to 108 MHz and 136 to 154 MHz. Furthermore, a wide band input from 0.1 kHz to 154 MHz and a combined in- / output for the ADC cycle (measuring, synchronization) is available. Connection standard is SMB, adapter cables to BNC or N are shipped with the module / device. 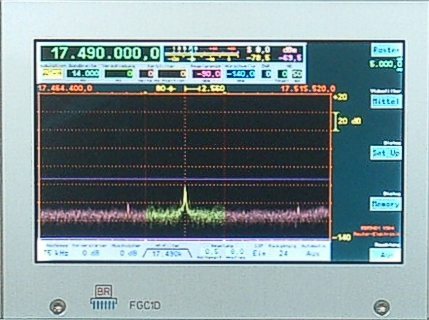 The supplied high frequency signal is scanned with two ADC in push-pull circuit (“digitized”). The used ADC chips are low-noise and distortion dampening (IM). The 17 bit wide digital signal is transferred via LVDS Bus links onto the bus board of the basic unit and can then be used by various signal processing units. The operation is performed via the networking interfaces of the operating system. The inherent noise (preamplifier switched on) is about -165 dBm/Hz (F=9 dB), sideband noise at 1 kHz offset about -143 dBc/Hz, at 10 kHz offset about -155 dBc/Hz. Optimized ADC module for RDR54/55, Standard ADC module for RDR160. The module contains a preamplifier and filter for 1 kHz to 30 MHz, 50 to 54 MHz, 87.5 to 108 MHz and 136 to 154 MHz range. Furthermore, a wide band input from 0.1 kHz to 154 MHz and a combined in- / output for the ADC cycle (measuring, synchronization) is available. Connection standard is SMB, adapter cables to BNC or N are shipped with the module / device. The supplied high frequency signal is scanned with four ADC in double push-pull circuit (“digitized”). The used ADC chips are low-noise, especially in the VHF range, and highly distortion dampening (IM). The 18 bit wide digital signal is transferred via LVDS Bus links onto the bus board of the basic unit and can then be used by various signal processing units. The operation is performed via the networking interfaces of the operating system. 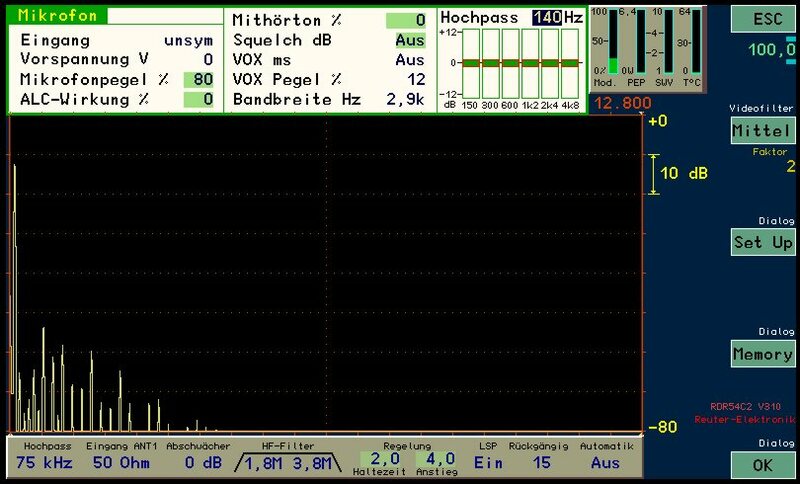 The inherent noise (preamplifier switched on) is about -162 dBm/Hz (F=12 dB), sideband noise at 1 kHz offset about -145 dBc/Hz, at 10 kHz offset about -155 dBc/Hz. Front Digital to Analog Converter FDA20F "Speaker Module"
Standard DAC module for RDR54/55. 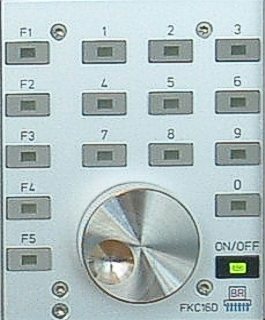 The module contains a stereo audio DAC with 24 bit resolution and 81.92 kSps sampling rate. The codec contains a DAC with PWM output for the speaker (“Class D”) and analog stereo output for headphones. An ADC for microphone signals is also integrated. The volume of the speaker and headphone can be regulated via a module-mounted encoder. The microphone port is realized as a RJ-45 socket with “ICOM standard”. Compatible microphones with RJ plug can be immediately connected. The signal contact of the microphone can operate with +5 V or +40 V.
The speaker and headphone signals are digitally supplied via a serial LVDS interface. 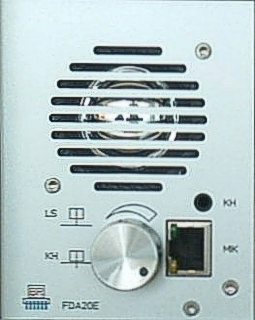 The digitized audio signals of the microphone input are supplied from this interface to the bus board and can be used by other modules (for example, transmitter). The operation of the module (configuration of the microphone input, volume control and so on) can be performed via the networking interfaces of the operating system. The module firmware contains almost all demodulators of the RD receiver. The microphone input is extensively configurable and features low noise and distortions. Rear Digital to Analog Converter RAD31B "Stereo-DAC"
Optional DAC module for RDR54/55, Standard DAC module for RDR160. The module contains a high-quality stereo DAC with 24 bit resolution and 81.92 kSps sampling rate as well as the necessary filters and re-amplifiers for Cinch outputs with 75 Ohm internal resistance. Version 31B additionally contains a headphone amplifier with max. 3.5 Veff output voltage for headphones from 16 Ohm impedance upwards. The digital audio signals for the module are provided from the signal processor via the bus board of the basic unit. 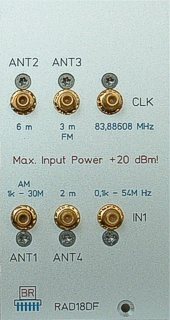 Only the demodulated signals of the time based demodulators are used (AM-E, FM, DSB/SSB-Q and DIGI). The output signal of the headphone amplifier is placed on shielded pipes on the bus board for connecting a socket to front modules. The operation of the module can be performed via the networking interfaces of the operating system. The output level of the Cinch outputs and the headphone output can be adjusted together (parallel). In particular configurations (measuring devices), the DAC module RDA31B can be used as a generator module for creating 2 sine waves up to max. 80 kHz with very high signal-to-noise ratio and very low distortions. The generator mode of the RDR receivers can be activated via a specific setting (frequency calibration to 0). Rear Digital to Analog Converter RDA31Dx "Exciter"
Optional DAC module for RDR54/55. 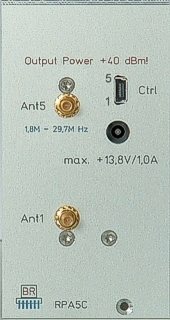 The module contains a dual HF DAC with 16 bit resolution and up to 667 Msps sampling rate as well as the necessary filters and re-amplifiers for coaxial outputs with 50 Ohm internal resistance. 3 versions with different output levels and frequency ranges are available. The operation of the module can be performed via the networking interfaces of the operating system. A serial audio connection allows the modulation of the exciter with a NF signal (for example, from the microphone input). All from the receiver supported operating modes can be modulated. In particular configurations (measuring devices), the DAC modules RDA31Dx can be used as generator modules for creating modulated sine waves with high setting speed and accuracy of the frequency. The exciter modules mostly reach IM intervals of > 60 dBc, at lower frequencies and levels even more. The display module FGC1D is a complete graphic module consisting of a short plug-in board for the front of the RMF bus system (“Graphics card”) and a 5” (13 cm) TFT display. The front panel incorporates a acrylic glass window with anti-reflexion coating. With a resolution of 800 x 480 pixels with a pixel size of 0.1355 mm², a maximum brightness (adjustable to 0 - 100%) of 300 cd/m² and a typical contrast ratio of 1:450, the display allows for sharp and detailed presentations. The module is supported from the operating system with its own graphic commands for 256 colors. Hardware accelerators for very high drawing speeds, especially for representing measurement pictures (oscillogram, spectrogram and so on), are provided. Drawing is done in invisible pages, so no artifacts (flickering, masking of measurement curves and so on) are visible. The general operation and management of drawing objects is performed by the networking interfaces of the operating system. The data supply for the hardware accelerators is performed by a high speed LVDS interface. Update rates for measurement curves up to > 1000 Frames/sec are possible. Special module for RDR54, standard graphics card for RDR55/160. The display module FGC2A consists of a short plug-in board for the front of the RMF bus system (“Graphics card”) for controlling freely mountable and / or detached displays. The common TFT displays / monitors with 6 or 8 bit/color and parallel data bus or LVDS connection (“Display-Link”) can be controlled. For controlling touch screens, interfaces with SPI and I²C standard are provided. The board contains 2 complete graphic engines with shared memory for displaying images on 2 different screens. The module is supported from the operating system with its own graphic commands for 512 colors. Hardware accelerators for very high drawing speeds, especially for representing measurement pictures (oscillogram, spectrogram and so on), are provided. Drawing is done in invisible pages, so no artifacts (flickering, masking of measurement curves and so on) are visible. Standard power supply for RDR54/55/160. The module is a 230 V~ power supply unit with max. 25 VA power for back-mounting into the RDR devices. Since version 25F, a DC input (2.5 mm female pin) for 13.8 V direct current (12.3 ... 14.5 V) is additionally provided. A 25 VA transformer for supplying voltage is used in the module. Rectifiers and controllers generate the necessary direct current for the RMF system (12 V analog, 5 V digital and analog, 3.3 V digital and analog). “Analog” designated currents are used for low-noise linear regulators, otherwise switching regulators. The module is remote controllable (control voltage via the RMF bus) and shows the off or on state via a multicolor LED (beneath the blue “Plug off” symbol). When error conditions (excess current, temperature, LED deep red) occur, the module switches itself off automatically. On the grid-side, overvoltage protections (varistors and gas discharge tubes) as well as a automatic reset fuse (PTC) are present. A 2-level fan is enabled at high power requirements (heating). Deactivated, the module has a power loss less than 0.1 W. It should still be unplugged from the main supply (for example, with the help of a switchable socket strip). 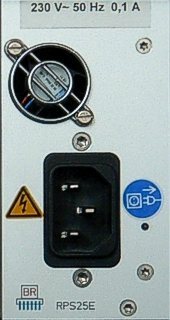 An IEC power cable with adapted safety plug is delivered with the devices with a fitted RPS25 module. The complete device complies with protection class I (“Protective Earth Connection”). 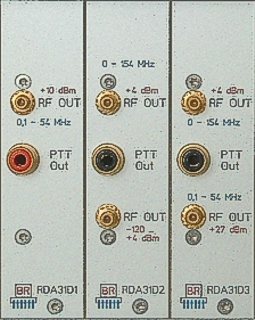 Standard signal processor for RDR54/55/160. The module contains a highly integrated FPGA Cyclone-III with 40 k logical units and a QDR-II SRAM with 72 MBit (version 25F1) or 36 MBit (25F2) capacity and up to 250 MHz clock frequency. Furthermore, a micro controller with USB 2.0 interface is provided. The module firmware of RDR54 to 160 devices configures the FPGA as a digital receiver with mainly spectrum based signal processing. The FPGA controls the interfaces of the RMF system as a master CPU and manages all other modules by that. Next to the logical control via soft core CPU (“Nios-II”), the firmware contains a hardware based proprietary time/frequency transformation algorithm with 4 times FFT speed for creating the data streams for display and DAC modules. For that, the data from the ADC modules are processed. A maximum of 8 different configurations are storable in the module. These can be updated via the USB controller by uploading them to a PC. A management program integrated into the module (“Bootloader”) determines the currently active configuration. The different configurations allow for a large degree of changes of the functionality within the device, for example the configuration of a microvolt oscillograph, a spectrum analyzer or of the RD receiver. Data can be shared with a host computer (PC) via a high speed connection (480 MBit). The RD receivers can be upgraded with the transmitter module RPA 5 for short wave amateur radio bands to a QRP transceiver. The module contains a digital polar modulator for all operating modes of the RDR54/55 and a 5 W transmitter for the 9 amateur radio bands in the range of 1.8 to 29.7 MHz. The transmitter operates after the principle of envelope modulation with high efficiency (no quiescent current) and with good IM behaviour. A transmitting/reception switcher is built-in in the RPA5 module. During the reception, the signal is broadcast from the transmitter antenna at socket Ant1 and can be led to the receiver input from there. The operation of the module can be performed via the networking interfaces of the operating system. A serial audio connection allows the modulation of the transmitter with a NF signal from the microphone input. With optimal settings, the envelope transmitter reaches an IM interval of 50 dBc on 175.1 yard (160 m) with 5 W.
Standard keyboard module for RDR54. The module has 16 keys and an encoder with button (push function-ality) to operate devices without touch screen. The keys are illuminated (LED). The encoder has a silent magnetic detent and is additionally fitted with a needle bearing. The rotary knob is made out of solid stainless steel and enables a slight flywheel effect. The module is freely programmable via the RMF operating system interfaces (generation of messages when pressing and releasing keys as well as pulse recognition of the encoder, switching of the LED, automatic flashing and so on). One key in the RDR54 is always configured as an on/off switch (switching of the power supply), 10 keys are for inputting decimal values and 5 keys as function keys with variable functions according to operating status (“Softkeys”). The keys have a distinct pressure point, but no acoustical feedback (click). RAS12C: In / Output 0 - 160 MHz --> Switcher --> Input 0 - 160 MHz --> Output 0 - 160 MHz. 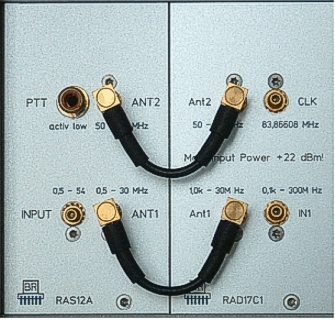 RAS12A and B evaluate the supplied PTT signal and separate the signal input from the outputs. They are intended for connecting the RD receivers to other devices (transmitter / transceiver), if their antenna is to be shared. Version A additionally contains a low-noise and low-IM pre-amplifier in high current CMOS technique for compensating attenuations (external antenna switcher, inlets and so on). The PTT signal is also used within the receiver for muting during broadcasting. RAS12C serves as a transmitting / reception switcher, if a DAC module RDA31D is to be used as an expansion to a transceiver. It is controlled by the internal PTT pipe of the RDR.